Starting flower bulbs indoors is called “forcing.” By forcing bulbs indoors, you bring a little spring into your home during winter. 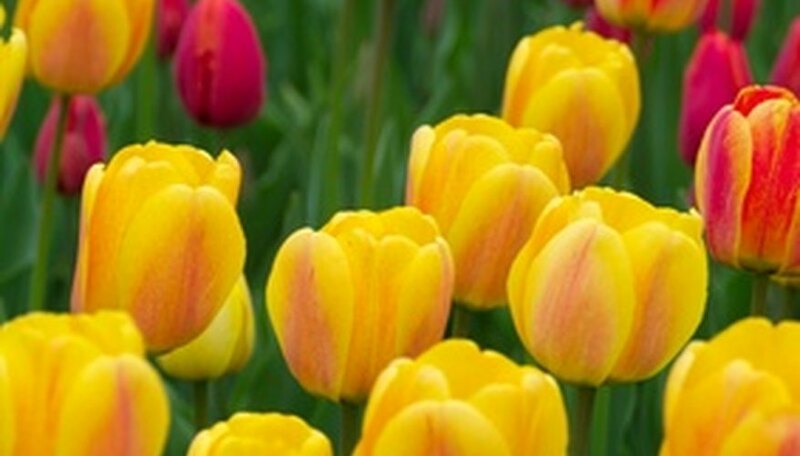 Flowers suitable for forcing include species such as crocuses, daffodils, hyacinths, paperwhites and tulips. Purchase bulbs from trusted garden centers and nurseries as soon as they're available in the fall and store them in a cool, dark location until you're ready to start them. Choose a container for starting the bulbs. Pick one made from just about any type of material, including plastic, ceramic or metal, as long as it is twice as deep as the bulbs and has drainage holes. Fill the container with a well-drained, commercial potting mix, leaving enough space to add the bulbs and enough additional soil mix to almost cover the bulbs. Place the bulbs close together on the soil surface, gently, and continue filling the pot with potting soil until just the noses of the bulbs remain above the soil surface. Iowa State University instructs to adjust the soil level until the bulb tips, or “noses,” are even with the container rim. Leave about ½ inch of space between the soil surface and the rim. Water the potted bulbs immediately after planting and don't allow the soil to dry out. Place the potted bulbs in a cool (50 to 60 degrees F), sunny location in your home. Move the pot to a warmer location once the shoots and leaves begin emerging, but avoid direct sunlight. Move the flowering bulbs to a cooler location in the evenings to extend the life of the blooms, recommends University of Minnesota extension office. Discard bulbs after blooming because most don't do well if planted outdoors after indoor forcing. Daffodil varieties are an exception, however, and may adjust to outdoor transplant after blooming. See Resources for information regarding saving forced bulbs. The University of Minnesota suggests 6 tulip bulbs, 15 crocus bulbs, 6 daffodils or 3 hyacinths will fit in a 6-inch container. Flat-sided bulbs like tulips should be placed with the flat sides against the container because the largest leaf will emerge from that side, forming a border around the edge of the pot. University of Minnesota Extension: Forcing Bulbs for Indoor Beauty in Winter.